We create fine art, archival prints up to 110cm wide, by almost any length, printed with state of the art colour management using the latest and best Epson printers and inks. Perfect for anyone who wants beautiful prints of their photographs, artwork or illustrations. We were the first lab in Australia to be certified by both Hahnemühle and Ilford as fine art printing experts. We source the best archival papers from respected brands like Hahnemühle, Ilford & Canson, and use Epson UltraChrome HDX inks to ensure you get the best result possible out of every image. These prints have been independently assessed as archival, with a lifespan ranging from 100 to many hundreds of years in proper storage. We take pride in getting your prints to you in the perfect condition and pack them as if they were our own. We understand the challenges of being a creative professional and offer very competitive pricing to allow you to get the best quality fine art prints at an affordable and sustainable cost. We are always willing to help and happy to offer individual tutorials, assist with any technical difficulties and of course provide friendly advice on printing, sales, shipping, packaging, mounting and exhibitions. Our intention is still the same as when we started - to provide a superb and accessible archival printing service to artists, photographers and designers. Right from day one, colour management has been at the core of our work, which has allowed us to still be printing edition runs for artists 10 years after the initial print. Our work has been exhibited in many galleries in Australia and all over the world. We print for many well recognised Australian artists including cartoonists like Michael Leuing and Alex Stitt, photographers like Jason Edwards, oil painters like Jeremy Geddes and Ross Watson. We also enjoy working with up and coming artists and beginners of all levels. Our clients are diverse with some selling their prints for $50 on Etsy, and others selling limited edition prints for over $5000 to art collectors around the world. Set up your files for print with our easy to use downloadable templates. Place your order online with our user friendly ordering interface that allows you to include comments as you go. Send your files to us through our online file uploader, via mail, or drop in to see us at our North Melbourne office. When we receive your files and your online order we start printing. Our turnaround times are normally 1-2 days, but may be longer based on our current workload. Once your order has been completed it will be carefully packed in archival wrapping. You will be notified that your fine art prints are ready to collect or have been posted. We have printed samples for viewing of all our papers at our office in North Melbourne. If you live interstate, want your own sample to keep, or can't get into our office, simply order a Printing Sample Pack that contains a small printed sample of our 10 most popular papers. Just $10 and you get the full price back when you order your first print! You could also just send a print job to us and have a few sample A4 prints of your own work made, so you can get an idea of just how beautiful these materials are, and what they can do for your work. Our favourite 100% cotton smooth matte fine art paper – contains no optical brighteners! The most popular fine art inkjet paper in the world, loved by printers and galleries everywhere. Also available in Deckle Edge option on request. Our favourite warm tone fine art and most eco friendly paper option. A fine art paper that is a beautiful representation of traditional sumi-e papers used in calligraphy art. Heavily textured with an organic feel – best with larger prints or the texture can be too much. Ilfords flagship fibre based paper for high impact black and white prints – also great with colour. A gorgeous highly dimensional high gloss paper with a remarkable ‘pearlescent’ metallic finish. Classic darkroom style paper, providing the aesthetic and feel of the original F-Type Baryta Fibre paper and contains no optical brighteners. The world's most popular inkjet paper with the classic photo look. Very robust, great for albums, and any context where prints will be handled. A crisp white poly-cotton canvas with a matte, lightly toothed surface. We also print on other materials such as Ilford Ilfotex adhesive material & Chromajet Clear Film. For more information on these please see the FAQ section below. You can also supply your own paper for us to print on. Give us a call to discuss in more detail and providing your media is compatible with our printer, we will provide a quote for your particular job. More information on this below in the FAQ's. All Fine Art Print pricing is available on our order page below. What are your printing prices? Sheet print prices are A4 - $15, A3 - $30, A3+ - $40 & A2 - $55. 24” & 44” Roll prints are charged per 5 inch increment starting at $35 for 24 by 10 inches and $165 for 44 by 25 inches. Rather than just sending us your images with your requested size, we ask that you drop your image into one of our templates. This allows you to see exactly how it will look once printed on the page including the white space around the image. All you need to do is download the template for the paper size you are printing on and drop your image onto it at 300 PPI, making sure you keep within the printable area guides, and save it as a flattened RGB JPG or TIFF file. We are happy to help by doing simple layouts for you for a small fee of $5 per image. Just provide us with the largest file you have and detailed instructions of what you need (dimensions of the image itself and white space requirements). We have a more detailed guide on how to prepare your files here. The easiest way to send us your files is through our online file dropbox. Click on the link here and simply upload your files. You will receive confirmation once they have been uploaded. You can also mail us your files on CD/DVD/USB or drop them into us at our office – 95 Howard Street, North Melbourne, 3051 VIC. We have a client machine for you to view your images before print and make small adjustments if required. We have a tutorial on how to send us your files here. Do you provide ICC profiles so I can soft proof my images prior to printing? We have both colour and black and white profiles for download. Please ensure you do not embed these profiles in your images – just leave your images in their original colour space and we will do the conversions here. Please proof your images using the Perceptual Rendering Intent - this is the rendering intent that will be used when we print. ICC profiles can be a bit tricky to understand at first and take experience to understand fully. Just trust the process and if you see anything strange let us know. (If you turn on 'simulate paper colour and ink black' in Photoshop (and we recommend that you don't) - you will experience Photoshop's thoroughly broken contrast proofing system, and we suggest that you ignore most of what it is telling you). For more detailed instructions and explanation on the above read our notes on how to use our profiles - click here. 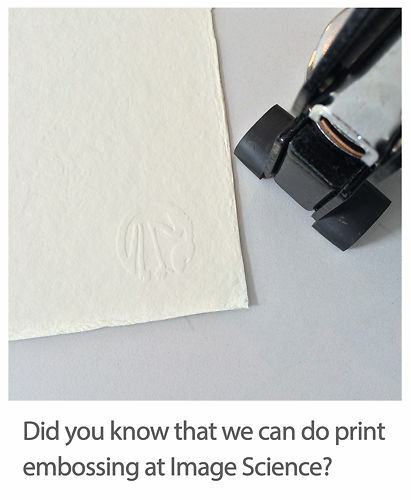 Yes, we offer a print embossing service (also known as a ‘print chop’ or print marking). You can have your prints embossed with the Image Science Mark or your own custom design. Print embossing can be used as an alternative to signing if you would like to send your prints directly to your clients. If you are interested in having a custom embossing stamp made or want more information, click here. How will my prints be packed and shipped? We take great care in packing your prints to ensure they get to you safely. All sheet prints are individually placed in an archival clear bag and sent out to you packed flat. Anything larger than A2, e.g. roll prints, are wrapped in archival clear film and sent in a mailing tube. Sending prints rolled in a mailing tube provides better protection against damage while travelling. Allow your prints to lay flat for a few days before use or framing. Everything we send out is fully insured and if damaged will be re-printed and sent to you free of charge (once evidence of damage is received). Do you keep my images on file after they have been printed? We keep your images on file for approximately 3 months in our printing archive, after which they are deleted. If you require a reprint of a file within 3 months of the initial print, just place a new order with the details of the file - there is no need to re-send. If you are going to be completing edition runs of your images, we do provide a free secure store and print service. We store your digital files here and print your images as you need them. This means that you don’t need to print your complete edition run at once and can be confident that each print is a perfect reproduction of the last. It also provides a handy off site backup for your files. For more information on our store and print service and edition runs, see here. How should I handle my inkjet prints after they have been printed? Inkjet prints are beautiful and versatile; however they can be delicate and need to be handled appropriately. The basic rule is; don’t touch the inked area and ideally always use gloves. We have a detailed article on how to handle your fine art prints, which includes information on coating, spotting, trimming, packing and storage. Can I paint/work over my fine art prints? Yes you can, but we do suggest that you test the particular medium on a sample print to see the results. We generally recommend acrylics as our pigment inks are water based, and therefore it's probably better to stick to water based materials, but we have also seen oils being used with success. There is no guarantee about the archival longevity of your piece after painting on it, as chemical reactions can occur such as yellowing, but experimenting is all part of the fun! How should I describe these prints to my clients/customers? These fine art prints are best called Pigment Ink on Archival Paper. They are also commonly referred to as Giclee prints. How large can I print my files? You can often print your files a lot bigger than you realise - don't worry too much about the classic 300PPI figure as that's really a bit out of date these days. We have printed many large prints at much lower figures, like 150 PPI, and they've held up very well. Remember, pin sharp images are not always that important when it comes to overall aesthetic - much more important is composition, message and expression, so don't let lack of resolution stop you from making a huge print if that's what works for the image. You can actually send us files at any PPI and our printing system will re-sample them automatically to our printer's resolution (and do so at least as well as those expensive plugins like Genuine Fractals etc.). For more information, read our Resolution for really sharp prints knowledge base article. Do you offer a print trimming service? Simple trimming is charged at $5 per print. Simple trimming is trimming one image to size (i.e. up to 4 cuts). More complex trimming is charged at our retouching rate of $80/hr, with a minimum of a half hour. N.B. We require you to add crop marks/trim lines to your images and we will then trim them down accordingly (we can't accept instructions like 'trim 3cm off the left' as this requires a lot more time on our part for the measuring etc). Can I print multiple images on a roll print & cut down to individual images? You can certainly print multiple images together as one roll print - just lay out your file and whitespace however you like - the printable area is all yours to use as you see fit (we suggest you use our templates to make sure your images remain in the printable zone). We charge $80/hr for more complex trimming work (with a minimum of $40). Trimming down multiple prints from a roll print takes a lot of time to do carefully and well, so please be aware this can add substantially to your final cost and often it's actually easier/cheaper to simple have the prints done as separates. We do not recommend printing lots of smaller prints this way - trimmed roll prints will exhibit a significant amount of paper curl. When roll prints are large, the weight of the paper works against the paper's memory effect and so the prints sit fairly flat - however when you cut down roll prints to small sections, the full curl of the paper is expressed and it can be substantial. So if you're aiming for smaller print, sheet prints are usually well worth the extra cost. Can I supply my own media for you to print on? Yes, you can also supply your own paper for us to print on. Your media must be compatible with our printer, (inkjet, coated, for waterbased inks- not solvent based) and we will need at least 4 sample pages to produce an accurate profile for the paper before we can do the printing job. This process takes 24 hours so please ensure you add this to our current printing turn around time. Pricing for your prints will be 10% lower than our standard printing prices as you are supplying the media. Contact us to discuss printing on your own media in more detail and to obtain a quote for your particular job. Can you print on film suitable for creating screens for screen printing? We print on Chromajet Clear Film, which is suitable for creating screens for screen printing. This service is currently only available on 24" rolls, but if you require anything bigger let us know and we will see what we can do. Chromajet Clear Film is also great for signage applications such as window decals. Do you have any suitable materials for printing wallpaper or decals? We print on a self adhesive polyester fabric called Ilfotex, which is perfect for all things signage, wallpapers, decals and wraps. The adhesive is non marking, removable, and very re-usable. Ilfotex has a smooth surface and produces sharp printing results. Prints are only available on a 42 inch roll and can be printed up to a maximum length of 3 metres. Pricing is charged at $50 per half running metre. Can I have my prints sent directly to my customers? Current estimates for normal sized jobs only. Full info here. Every time I have used Image Science, I have been extremely pleased with not only the service and support but also the quality of the prints. Thank you!